There are a couple clues here, I think. If you are familiar with this item it may becoming clearer to you now. To enter the whazzit contest, leave a comment on this post with your guess. No comments will be revealed before a winner is determined. One guess per person per post. Have you figured it out yet? I am filling a fun baggie for the prize while I hit all the craft and stitching stores in Colorado! I wonder if there is a winner yet? Have you taken a guess at what this item is? Enter by leaving your guess in a comment on this post (limit of one guess per person per day) and when I get back we will find out who was the first one to come up with the answer. As you read this, I am already shopping for the prize on my way to Colorado. The CQI Retreat always involves some wonderful shopping opportunities so guess where the prize will be coming from? Yes, you guessed that one right, I will be picking up some goodies while I am browsing the stitching stores in Colorado and that will be the prize. Even I don't know what it will be yet! So, have a close look and take a guess! I am eyeing up a round robin signup at CQI for a Steampunk theme. I may succumb to temptation and put my name down. With this in mind, I have started collecting odds and ends for it. So far, I have these wonderful clock faces I ordered that arrived the other day. Don`t they look like fun? I also found a strange little piece of metal, kind of a double spring, while vacuuming - I think it is part of a tv remote that Duke ate last week. Wonder what I can do with it? I`ll find a way to use it I think. Just a wee note to say I will be away from the computer for ten days or so starting early tomorrow morning. I am off to the 3rd Annual Crazy Quilting International Retreat in Colorado. This year it is being held in Estes Park which looks like another beautiful scenic location. When I get back I will have lots of photos and stories to share! I am very excited about the retreat - it is an opportunity to meet in person the folks I talk with online every day and who share my passion for crazy quilting! We all share and learn so much from each other and this is intensified at the retreat! Last year I was able to learn to emboss velvet, take a button painting class from Gerry, dye lace, and so much more! Now, since I have yet to pack for the retreat, I had better get a move on! Stay well and see you when I get back! Hugs! Since I have become more and more interested in miniatures, I have been looking for miniature gingham so I could try my hand at some chickenscratch embroidery on a 1-12 scale. Finally, I found some - thanks to a heads up from my minature guru, Lorna. Lorna has been doing miniatures for years and is directly responsible for my growing obsession. Now that I have the gingham, I can`t wait to start! The scale on this works out to 1.3 squares per inch which would be some really big gingham but it is the smallest I have been able to find so far. It makes you dizzy to look, so this may prove to be a challenge. I bought one meter each of five colours. Doing a little calculation, at 1-12 this would be the equivalent of 60 meters of length but then if you take into consideration the width, it would really be the equivalent of 720 meters. Hmmmm... can we say carried away? roflol It didn't seem like that much when I bought it! I posted the clown fish and sea anemone detail a little while ago but now I have the whole block done I thought I would post it too. The colour is a bit washed out so you might have to use your imagination a little - it is actually quite bright. The focal point of this block was the clown fish. Underneath on the tan fabric representing the ocean floor, I have added one of Nicki Lee's wonderful hand-dyed lace motifs, in this case a lovely yellow/green starfish. To the left of it, is a beaded starfish. Above these and along the seam line there are assorted beads and shells attached to represent pebbles etc in the sand. On the far right are a couple strands of assorted fuzzy yarns for seaweed. Between the seaweed and the starfish, you can see a portion of another one of Nicki Lee's lace motifs. In this case it was a floral motif and I removed the flower portion on the top to use another day and attached the leaves as another ocean plant. There are two shell fish hiding amongst the seaweed. The odd bit of stitching in the top portion of the block was meant to simulate the wave motion of the water. To see a much better example of this, check out the photo on Sharon B's Pintangle blog - this was my inspiration. As always, I can see about a dozen things I would like to improve, redo, or replace but the nature of round robins is that you really do have to mail them on so I am forced to quit before I am ready and send it away. I do wonder if I would ever be ready though if I were allowed to keep this block and work on it as long as I like! Sea anemones and clown fish have a symbiotic relationship. Clown fish are able to live with certain types of anemones without being stung and are protected in this way. In return, they feed off leftovers and algae on the anenome and create better water circulation for the anemone by moving around. I am becoming more and more enthralled with the miniatures I am seeing online. If you are interested, one of the lovely artists I am following is having a giveaway at Sophia Miniatures. Check it out! I am happy to report that Bear and Duke are now seeing eye to eye, as you can see from this picture. Once they had become acclimatized to each other, we let them loose together and studiously ignored both of them. I have to tell you though that the peripheral vision got a real workout while they were being "ignored"! Happily, they got along well. Bear is fascinated by Duke and his immense size - she runs as fast as she can trying to catch up with Duke and then when Duke turns around, she runs twice as fast the other way. Once playtime is over, they flake out together like the best of friends! Well, it was a pretty sad time at the airport yesterday seeing the kids away. Three sets of grandparents in attendance, as well as parents, and not a dry eye in the house. I am going to miss these beautiful children so much - but now I have to keep telling myself that a year is not so long. I am anxiously waiting for the kids to get in touch via Facebook so I can hear all about their adventures in England. Here is what I came up with for this week`s Build a Seam (BAS) Challenge, the Half Cretan Stitch. I added a bead on the bottom of each stitch, a couple detached chain stitch leaves on the top and a funny little flower of straight stitches in red, all done in DMC cotton floss. Finished my work on Ely`s block! I finished my work on Ely`s block at last - took me awhile! Some of this I`ve posted about before - some is new. I mentioned the tree before - I am hoping that the other stitchers will join me on that patch adding things and that between us all we can build a lovely garden there for Ely. The white beaded flower on the far left is an Avon earring of all things! lol I liked the way it echoed the shape of the flower already embroidered on the fabric. I added the adjacent seamwork. Moving up the block there is my spider and web, my BAS Seam 58 above that and then two dragonflies built from silver beads. Above that is ribbon stem and leaves with spiderweb roses made from pearl cotton. To the left is the initial salvaged from a hankerchief with the ruched ribbon and pearl border and to the right is another pink seam. This is Ely`s entire block after I`ve done stitching on it. There are so many seams to stitch treatments for but I need to mail this on now. I am filling in as round robin angel for two stitchers who have had to drop out of this particular round robin so I`ll have another chance to add more when it comes back around my way. These two gorgeous kids are my darling grandchildren, Allie and Sam. They are heading off to England to spend a year with their Dad on Saturday so there was a going away party for them this last weekend. The ice cream cake I had made at DQ was a big hit - I thought the girl who decorated it did a great job putting my ideas on the cake. Melinda and her children were at the party as well. Bobbi, Sam and Allie`s mom and my son`s better half, and Melinda have been friends forever and their children have grown up together. It shows - can`t you feel the love in this picture? This is Sam again chowing down! Here are Sam and Allie, opening their little goodbye cards and gifts from us. That is my son, Sean, over on the left. I love watching him watching the kids - you can tell how much he loves them just by looking at his face. The party was a barbeque - here is the feast on display! Bobbi is such a great cook - even hot dogs and hamburgers are special when she makes them! Really! The hamburgers were to die for! These are my guys: son, Sean, and husband and love of my life, Gary. Since it was a Sunday afternoon they spent a lot of the party on the sofa watching football. It was a lovely party. Bobbi`s parents, Cheryle and Pat, were there too and it is always great to see them. Great party... but I`m trying not to think about the reason for it too much! I am going to miss these kids so much - I know I`ll be a blubbering mess when I go to see them off at the airport. With many apologies for my slacking off, here I am again presenting another Build a Seam (BAS) Challenge. This is called the Cretan Catch Stitch and I thank Cris from CQI for letting me know the name of it! As you can see, this stitch is like a cretan stitch on the top and a herringbone stitch at the bottom. I hope you enjoy seeing what you can do with it! 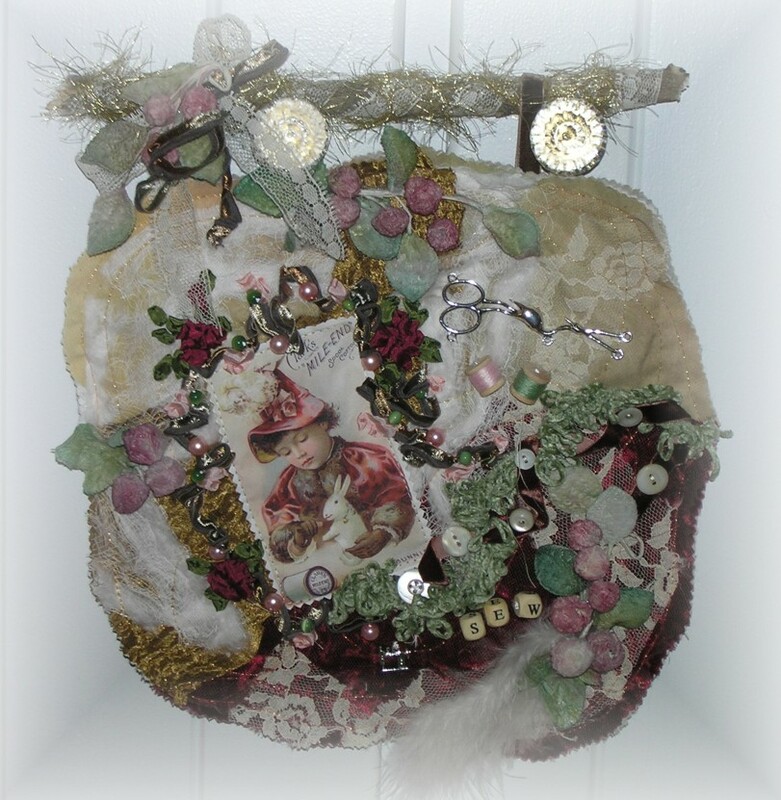 Pam Kellogg of Kitty and Me will be holding a draw for this darling little sewing themed art quilt she made when her blog reaches 300 followers. I just checked and there are 276 right now so it won't be long. You should run over to Pam's blog and enter now while there is still time! Wouldn't this look beautiful hanging in my sewing space, providing constant inspiration? Yup, that's right - my sewing space! lol I have my fingers crossed to win this puppy! While you are over there, check out the great guest post by Allison Aller - she takes you step by step how she creates her gorgeous landscape quilts. On August 10th, Alex Anderson and Ricky Tims were joined on the set of The Quilt Show by members of the AAQI (Alzheimers Art Quilt Initiative) Board Members: Kathy, Susan, Mary, Diane, Ami, Beth. This day marked the first time the new travelling exhibit, “Alzheimer’s Illustrated: From Heartbreak to Hope”, was displayed in public. I am so excited to see this photo and see how it looks! The purple panels hold 10,000 names of those affected by Alzheimers and other forms of dementia. Each name is written on the reverse of a piece of purple fabric, the slightly washed out appearance of the back side of the fabric reflecting the effects Alzheimers has on the mind. Aren`t the Name Quilts beautiful?! They remind me of panels of stained glass and I can just imagine how moving it would be to see them in person with the other AAQI quilts hanging with them. If you look at the photo carefully, you can see my little crazy quilt hanging on the far right behind Ricky Tims. I am so proud to be part of this exhibit and can`t thank AAQI enough for choosing my little quilt made in honour of Aunt Olive. I dream about it travelling around and helping raise awareness of Alzheimers before it is finally auctioned at the end of the exhibit. 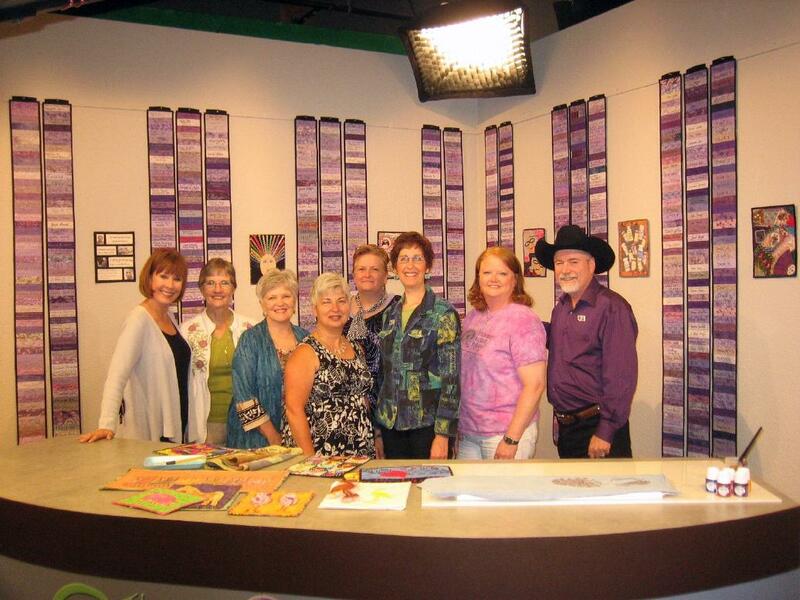 This episode of The Quilt Show featuring the Alzheimers exhibit will be aired sometime in December. I will definitely keep you posted as to the date! If you would like to take a small step in supporting AAQI, visit Facebook today and sign up as a supporter of this cause! Thank you! The world`s slowest stitcher (that would be me!) has done a bit more work on Ely`s block. I had a hankerchief saved in my stash which I thought had the prettiest initial E on it so I had to find a way to incorporate it. In the end, I cut the initial out in a circle, backed it with a bit of quilt batt and appliqued it onto the block with buttonhole stitch. To trim out the edge of the applique I ruched some green silk ribbon and attached it using pearls. I admit to finding this block a challenge, which is the point of round robins as far as I am concerned of course! The block has a lot of little strip pieces and the fabrics are all beautiful but busier than what I am used to working with. Many of the fabrics are preembroidered, sequined or heavily patterned. I don`t want to distract from the beauty of the fabrics so I that is my challenge. On this lovely strip of pink pre-embroidered fabric, I tried to accomplish this goal by incorporating my design with the existing flowers. I stitched a spider web for luck, anchoring it to the plants embroidered on the fabric, and then built a little spider on a nearby branch. I like the way the motif worked. On a completely different topic, one of the enjoyable aspects of being home from the summer job is being able to haunt my favourite thrift store again. On my treasure hunt there this week, I found this cute little Heartwood Creek store. It is now serving as a handy little bookend on my computer desk. It makes me smile so was well worth the $2 I paid for it. While I was in town running errands, I also picked up this new Continuing Education class schedule for the Fall and Winter. And what did I find inside the new class schedule? Yes indeed - proof I am following through on those new year resolutions! As soon as I have time to think about it, I am sure I will have butterflies in my tummy about teaching this class! Right now I am so busy that I don`t have time to get nervous. I think it is a help to have been blessed to take classes from some outstanding teachers myself - Tanya Berlin, Dakotah Rogers, Bunty Severs, etc. I know which teachers I enjoyed the most and learned the most from, so I have great examples to follow. I am keeping a positive attitude about this class and am already discussing teaching a workshop for The Calgary Guild of Needle and Fibre Arts later in the fall. I was studying Christine Dabbs`wonderful Crazy Quilting book and left it sitting on the kitchen table the other night. Now that Duke Ellington, the bloodhound, has started eating my treasured stitching items again, I know I am really home! I am now trying to distract Duke with a new type of chewie I picked up at the pet store this week. It is a piece of elk antler - he seems to be really enjoying it. This weekend has turned into quite the little social time with two parties I would have missed if I had gone through with my BC trip so they are providing some consolation. Yesterday we attended a great end-of-the-season get together at Little Bow Campground. In attendance were those who work at Little Bow, Travers, Carseland-Windham and McGregor campgrounds as well as support staff. It was a great opportunity to meet the folks we talk to on the phone all summer. The bosses, Mirko and Maria, prepared a feast for us - a wonderful roast pig as well as a couple Croation taste sensations and everyone brought salads. Delicious! This is DD, Katie, and Howard, who works at Travers Reservoir Campground. They have become fast friends this summer! Well, that was my Saturday! I hope you had a wonderful one too, and that today is another great day! Why do I do this to myself? Why do I decide to stitch motifs of millions of little french knots? You would have thought I would have learned by now but I never do! Here I am, so behind in all my round robins suddenly and I decide to make this tree on Ely's garden themed blocks of almost a whole skein of french knots. Well, I have to admit I love the way they look and I don't think you can beat french knots for foliage on trees or a topiary. For this particular tree, I used french knots with two wraps, using two strands of DMC cotton floss for the foliage. For the trunk, I tweeded two colours of brown DMC, one strand of each, and chain stitched up and down to give it some texture. I also spent almost a whole day trailing through the shops trying to find a vintage dinky toy, the kind with the rubber tires that come off the wheels, because I thought it was calling out for a tire swing. No luck on my treasure hunt this time though. So, this is Ely's block in its entirety. As you can see. I grabbed that big white space right off the bat. I think though that in order not to be too greedy, I will leave it with just the tree on it and suggest to the other stitchers in the round robin that they add to it as a garden theme. One thing all those french knots did was give me lots of time to think about what to do on the other spots so I am ready now to finish up the other spaces - they are all planned out. Then I will get it off in the mail and on its way to the next stitcher. It's that time again... time for the monthly slow and silent auction at AAQI! The quilts are exceptionally beautiful this time around. Please take a minute to check them out and bid! bid! bid! All proceeds go towards Alzheimer's research so your money is going to a great cause and it is never too soon to start your Christmas shopping! The people in Parry Sound, Ontario, have started something called The Bra Project. They are building a virtual clothesline of art bras to raise awareness of breast cancer. I'm happy to have added my artbra that I made for The Way to Women's Wellness to the clothesline! The clothesline is now at 40 ft, 6 inches. My favourite is Disco Tatas! Check it out!